Lördagen den 9 november 2013 försvarar Nadi Tofighian sin avhandling som undersöker hur film påverkade samhällsrelationerna i koloniala Sydostasien vid föregående sekelskifte. 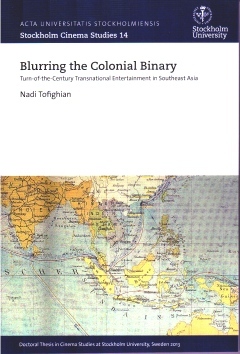 Nadi Tofighian försvarar sin avhandling i filmvetenskap, med titeln "Blurring the Colonial Binary: Turn-of-the-Century Transnational Entertainment in Southeast Asia", lördagen den 9 november, kl. 10:00 i F-salen i Filmhuset. Lördag 9 november 2013, kl. 10-12 i F-salen, Filmhuset, Borgv. 1-5, Stockholm. Disputationen är öppen för alla. Blurring the Colonial Binary assesses the development of cinema in colonial Southeast Asia, and how it disrupted notions of racial hierarchies. The book charts the development of cinema, and its distribution and exhibition, from a transnational and colonial perspective. The first decade of cinema in Southeast Asia, particularly Singapore, is used as a point of reference from where issues such as imperialism, colonial discourse, nation-building, ethnicity, gender, and race is examined. It demonstrates the interconnectedness of Southeast Asia, and its constructed national borders, by examining the transnational itinerant amusement companies that performed in the region. These entertainment companies, in turn, were dependent on imperial networks, in terms of trade and communication systems, which facilitated their movement between territories. Cinematic venues negotiated segregated, colonial racial politics by creating a common social space where people from different ethnic and social backgrounds gathered.